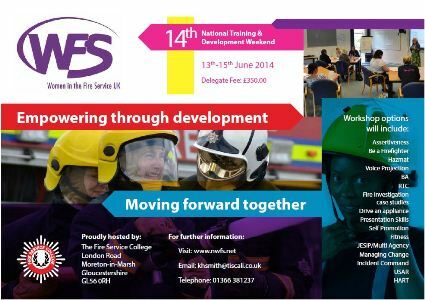 Women in the Fire Service UK (WFS) have an exciting weekend planned at the Fire Service College on 13-15 June enabling delegates to experience the excellent facilities firsthand. The workshops held at the event will vary from Voice Projection and Presentation skills to JESIP/Multi-agency, USAR and demonstration of Search and Rescue dogs and multi-appliance operational incidents. Click here to see a full programme of events. Click to download the online booking form.